Congratulations, you did it! You found the perfect mask (that you bought at New England Dive…wink, wink) and it’s everything you dreamed of. It fits your face just right, the color matches your other gear perfectly, and your vision is so perfectly clear you barely notice it’s there. But, it won’t stop FOGGING! Have no fear, our equipment experts here at New England Dive, have complied some tips for you that will help you find the solution. Which brings us to our first point, Anti-Fog Solutions, there are many anti-fog solutions available on the market. Yes, some do a better job than others. Every scuba diver has their own personal preference. Some scuba divers think the one they prefer is THE product to use and all others are garbage. We at New England Dive sell several anti-fog products. Each scuba divers’ opinion matters and we want to give you the right to choose which one works best for you. NO MATTER HOW MUCH OF ANY SOLUTION YOU USE, A NEW MASK WILL KEEP FOGGING UNTIL YOU SCRUB IT. A new dive mask needs a good mask scrubbing with some actual bottled and sold mask scrub. Mask scrub is the best way to make your first step toward a non-fogging mask. (toothpaste can be substituted for mask scrub in a pinch). 1) Remove new scuba mask from protective case. 2) Squeeze pea sized amount of mask scrub on inside of mask lens. 3) Using your thumb and/or pointer scrub the lens with a good amount of pressure for 5 minutes. Make sure to get the corners. 4) Rinse mask scrub from mask completely. At this point, your chances of a fog free mask have risen dramatically! 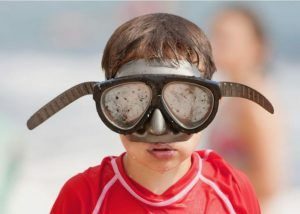 Make sure to follow the directions specific to your anti-fog before your next trip into the water with it. Still having problems with fogging?